IMG_1097, originally uploaded by All Things Mimi. I really like Rachael Ray's magazine. The best part about it is you get the great 30 minute recipes, without having to hear her annoying voice and watch her ridiculous mannerisms. This turned out really well. I tweaked a few things, and I'll note them in the recipe. This soup paired very well with the salad and mayannaise biscuits I made. And the leftover Quadruple Chocolate Loaf Cake rounded off a pretty darn perfect meal. In a dutch oven heat olive oil and saute the leeks and celery until tender, about 5 minutes. Season to taste. I then deglazed the pan with some white wine. Add chicken broth and bring to a boil. 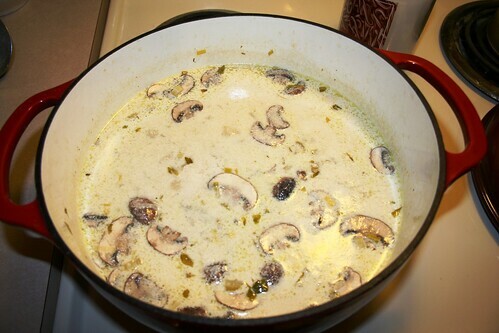 Stir in cream, lower the heat and simmer until soup bubbles at the edges. Add the chicken and gnocchi (and I added some sliced fresh mushrooms) and cook another 5 minutes. Stir in parsley and sherry (again, I used wine) and paprika. I also mixed together a tablespoon of cornstarch and some water and thickened it at this point. I then let it cook about 5 minutes longer. I would make this again. Actually, I will be eating it for lunch everyday the rest of the week. It serves 4-6. I tried this also and it was so delish! I didn't use the paprika or the sherry. I'm trying to make it without the gnocchi and substitute with potatoes instead.